UK new car market declines in January – down -6.3%, as 163,615 cars leave showrooms. Demand for petrol and alternatively fuelled vehicles rises, but fails to offset fall in new diesel registrations. SUVs only vehicle segment to show growth, with 6.6% uplift leading to record market share. 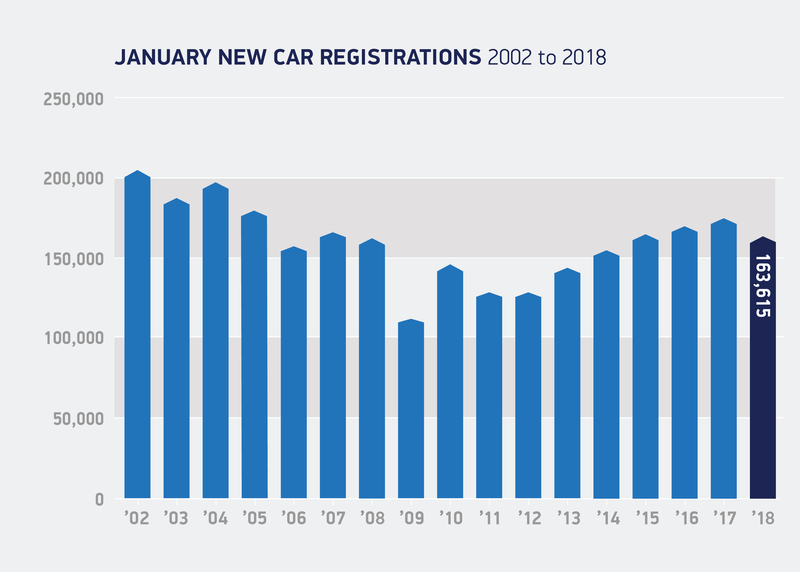 The UK new car market declined in the first month of the year, according to figures released today by the Society of Motor Manufacturers and Traders (SMMT). 163,615 cars were driven off forecourts in January, a -6.3% fall compared with the same month in 2017. Demand fell across the board, with registrations by business, private and fleet buyers down -29.7%, -9.5% and -1.8% respectively. Meanwhile, continuing the trend of recent months, dual purpose cars (SUVs) were the only vehicle segment to see growth, with demand up 6.6% to account for a fifth (20.2%) of all new car registrations. Demand in all other segments fell, with the biggest declines affecting the mini, MPV and executive segments. Elsewhere in the market, registrations of petrol and alternatively fuelled vehicles (AFVs) rose, up 8.5% and 23.9% respectively. However, this growth failed to offset a significant decline in demand for new diesel cars, which fell -25.6% as confusion over government policy continued to cause buyers to hesitate. Latest SMMT figures illustrate the importance of diesel cars and engines to the UK economy. Last year, more than two in five of the cars leaving British production lines were diesels,1 while manufacturers also produced more than 1 million engines – directly supporting some 3,350 jobs and, combined with the UK’s petrol engine output, delivering some £8.5 billion to the economy. The ongoing and substantial decline in new diesel car registrations is concerning, particularly since the evidence indicates consumers and businesses are not switching into alternative technologies, but keeping their older cars running. Given fleet renewal is the fastest way to improve air quality and reduce CO2, we need government policy to encourage take up of the latest advanced low emission diesels as, for many drivers, they remain the right choice economically and environmentally.